AU and a collective 1,218 other colleges and universities, governors, mayors, businesses, and investors from across the US have declared they will ensure the US remains a global leader in reducing carbon emissions. Together, these organizations and individuals send a strong signal to the international community and the 194 other parties to the Paris Agreement that in lieu of US federal support, they will continue the US commitment to ambitiously address climate change. AU’s involvement dovetails with the university’s commitment to become climate neutral by 2020. Among the most ambitious plans to achieve climate neutrality in the US, AU issued its climate neutral plan in 2010, two years after AU’s president had signed the Presidents’ Climate Commitment. AU was a charter signatory of the agreement. In seven short years, AU has made great progress on meeting the 2020 goal—perhaps the most notable effort being the Capital Partners Solar Project, in which AU teamed up with George Washington University and the George Washington University Hospital to purchase half of its power from solar. In the aggregate, the signatories are delivering concrete emissions reductions that will help meet America’s emissions pledge under the Paris Agreement. Signatories include leaders from 183 colleges and universities, 125 cities, 9 states, and 902 businesses and investors, as of June 5, 2017. Participating cities and states represent 120 million Americans and contribute $6.2 trillion to the US economy, and include Oregon and cities like New York, Los Angeles, and Houston as well as smaller cities like Pittsburgh, Pennsylvania, and Dubuque, Iowa. Business and investor signatories account for a total annual revenue of $1.4 trillion and include over 20 Fortune 500 companies, including Apple, eBay, Gap Inc., Google, Intel, Microsoft, and Nike. Hundreds of small businesses have also signed the statement. The signers contend that the Paris Agreement is a blueprint for job creation, stability and global prosperity and that accelerating the United States’ clean energy transition is an opportunity--not a liability—that will spur innovation and ensure American competitiveness. 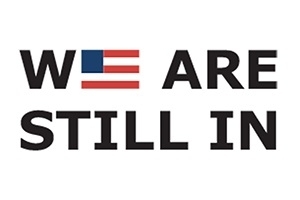 By declaring “We Are Still In,” the signatories are putting the best interests of their constituents, customers, students and communities first while assuring the rest of the world that American leadership on climate change extends well beyond the federal government.